For many who are about to embark on the Ketogenic journey, finding the best high-fat, low-carb foods for those meals is not always easy. Since the keto diet is based solely on cutting back carbs and adding more fats to your diet, you might be a little confused on which foods are ideal which foods should be avoided. Dieting, in general, can be difficult to navigate, and when doing it alone, it can be extremely hard to meal plan. What can you eat? What is the best for you? What gives you more energy? All the questions you may have when it comes to keto diet foods are good questions. Luckily, there are many different choices when it comes to preparing meals and even snacking that can keep you on track with your diet and still taste delicious. Here are seventeen different options to make your meal plan easier and tastier while pushing through that low-carb diet plan. Going low-carb doesn’t mean that you have to give up your oils and creams. 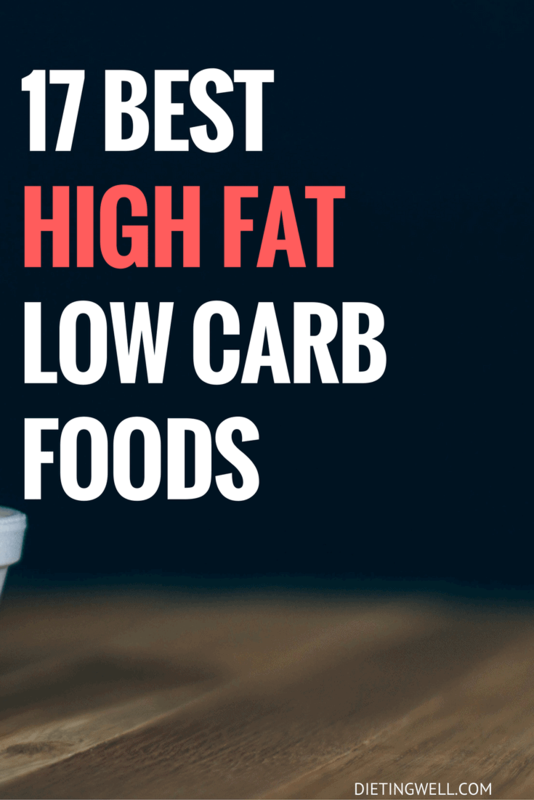 In fact, there are several healthy options that don’t blow that low-carb diet, and these options are loaded with fats to help put your body into ketosis. Coconut oil, olive oil, butter, and sour cream are just a few options that are delicious and healthy at the same time. Coconut oil is loaded with saturated fat. Though the word is a little scary, there’s no reason to be afraid of it. Coconut oil gives you an immediate jolt of energy that is long-lasting and not short lived. This type of fat is also idea for a keto diet because it can help burn more fat while in ketosis. Coconut oil is also full of many other benefits that can be seen after using or eating the oil for a period. It is good for your skin, healthy teeth and gums, and even anti-inflammatory properties. Coconut oil is made from 100-percent fat. Like coconut oil, olive oil is a great cooking option for those on a keto diet. Olive oil is 100-percent healthy fats, but it is loaded with other benefits. It has antioxidants, vitamin E, and reduce bad cholesterol to promote good cholesterol. Olive oil can be used to make marinades, dressings, and even sauteed vegetables. The possibilities are endless, and the benefits of eating olive oil are incredible. When going low-carb, that doesn’t mean that you have to give up flavorful foods. Butter is one of the biggest additions you can put into your diet for both fat and flavor for your foods. Ketosis uses fat to boost your fat burning systems, and butter is ideal. Butter is loaded with saturated fat, which helps your body absorb all the nutrients from vegetables. Fat-soluble vitamins, like A and K, cannot be absorbed without saturated fat either, which is why you shouldn’t cut butter from your low-carb diet at all but instead add a little bit more. Sour cream is a great addition to many meals that are rich in fat and great for low carb meal options. Sour cream, in just a few tablespoons, can give your body the fat boost it needs to help you get your body into ketosis. When shopping for sour cream at the grocery store, look for the full-fat versions instead of low-fat options. They might claim to be better, but really, the full fat sour cream is better for a keto diet. You can also try adding some dip mix to sour cream to create great vegetable dips for a snack. Cheese is a delicious snack for many people, though some think that cheese is not ideal for a diet. However, if you are going on a low-carb, high-fat diet, then cheese could be your best friend. Snacking on cheese is a perfect way to get your daily fats and nutrients all in one tasty treat. Cheddar, Swiss, and even Monterey Jack are all examples of a full-fat cheese. These cheeses are perfect for fat for your meals. Enjoy a slice of cheese for a snack, or incorporate it into your meals. Parmesan is another example of a great full fat cheese you can eat. You can enjoy cheese in many different ways as well. Add it to something you already love, mix it in soup, grate it for tacos, or even just enjoy a bit of cheese on the side with some vegetables. Remember to look for full-fat cheeses and not the low-fat cheese types. Cream cheese is one of the most delicious foods found in things like dips, spreads, and even desserts. Cream cheese is also great for thickening sauces and other things, and since it is loaded with healthy fats, potassium, and vitamin A, cream cheese is a great flexible option for a low carb diet. Cream cheese can be used in many different foods, so the versatility is perfect for adding a little something to your diet meal plan. Create something sweet or even just a fruit dip for your fruits. You don’t even have to feel guilty about eating something unhealthy. When you are on a diet, you don’t have to give up your snack foods. Instead of processed junk foods, however, you can try adding a few of our favorite options below. These foods are great for a meal or just a snack if you are looking for something tasty to curb your cravings. Just like bacon, you can enjoy whole eggs for breakfast without killing your diet. No more of that egg white only stuff, because whole eggs are an ideal source of healthy fats. They are economical, and they are easy to cook, store, and eat. Eggs have both fat and protein, which is ideal for a low-carb diet. They are a great source of choline, which your body needs to break down fats to convert into energy, an important concept in a low-carb diet. They are also low in calories, so you can feel free to add eggs to every meal if you want. Low carb dieters of all kinds enjoy eating avocados for many reasons. They are rich in nutrients like fiber, various vitamins, biotin, potassium, and omega three fatty acids. This food is great for dressings, dips, smoothies, sauces, salads, and more. Avocados are a versatile food as well, meaning that you can experiment with them quite a bit in your meals. With all of the benefits of this food, low-carb dieters will love the different ways you can use avocados for various meals. It is also full of healthy fat, which is ideal for that low-carb, keto diet. Chocolate certainly is a delicacy, and you don’t have to give up your tasty treat when starting your low-carb diet. Instead, you can enjoy a bit of dark chocolate to get your chocolate fix without all those guilty feelings. Dark chocolate can even help you lose more weight, if you eat it correctly, of course. Dark chocolate should be made from at least 70-percent cocoa solid for bars, and dark chocolate chips should be from 55-percent cocoa solids. If you want to enjoy dark chocolate as a snack, opt for the raw cacao nibs instead of the dark chocolate chips. Dieting isn’t always just about the fruits and vegetables, especially if you are on a low-carb and high-fat diet like the keto diet. Instead of putting down your meat fork, pick it back up. There are many great, tasty meat options that are low in carbs and high in healthy fats, which are ideal for your diet plan, especially if you are attempting a ketogenic diet. Yep, that’s right. You can go low-carb and have your bacon too. Bacon is not one such item that you have to do away with when starting a low-carb diet. Instead, eat more bacon because bacon is full of healthy fats. Bacon, which is also free of nitrates, has minimal carbs and just the right amount of protein. You can enjoy Canadian bacon as well as the breakfast versions. Create a great breakfast bowl option with bacon pieces. You can even add a little bacon to your omelet for a delicious breakfast option. Bacon is also great for other meals as well. Luckily, there is not a wrong way to eat bacon. If you are a meat-eater, then you might be wondering if the meat is good for a low-carb diet. Well, we’ve already mentioned bacon being an ideal option, so other forms of pork are just as great for your keto diet. Pork loin, ham, and pork chops are all great options for your meat in your meal. When you are preparing to purchase pork, however, you should be careful to avoid hams or other items that have added sugar. Ham is usually the biggest culprit, but often bacon will have added sugar as well, especially if it is brown sugar smoked. Fish is an amazing food for any diet, and a low-carb, keto diet is no exception. Fish is loaded with proteins, healthy fats, and omega three fatty acids that are necessary to a well-balanced diet. When choosing which fish to eat, it is always best to catch your own. However, if you are unable to catch your fish, get things like catfish, flounder, salmon, tuna, and cod are great options for your new, healthy diet. You can also enjoy shellfish like crab or lobster for more variety in your meal options. Poultry, like turkey and chicken, is high in fat and protein, though not as high as other options like beef or pork. When eating poultry, you should be sure to eat both the meat and the skin. Poultry has other nutrients as well, and since it is high in protein, it is a great option for those wanting to gain muscle. The low-carb diet also tends to make you tired as your body tries to adjust to the new plan. However, poultry can help give you back some of the energy you need since it is rich in protein as well as fat. The protein in poultry helps you attain sustainable energy that will last all day without any crash. Low-carb dieting doesn’t mean getting rid of ground beef. In fact, ground beef is ideal for your high-fat diet. You should look for ground beef with the highest fat content around because ground beef is rich in heart-healthy fat, called monounsaturated fat, which is heart healthy and also found in olive oil. Eating these fats can help lower your initial risk for heart disease by lowering bad cholesterol or raising good cholesterol. You should look for grass-fed beef options since they are rich in zinc, iron, and other nutrients. Add butter and cheese to your beef to get a great keto meal. While many vegetables and fruits are full of natural sugars are a not great for a low-carb, high-fat diet, there are some foods that are great for this kind of diets. For example, greens and nuts are great for your diet since they are full of protein, fats, and other nutrients. We will discuss a bit more about these options below. There’s no doubt that green vegetables are great for a diet, and they are even great for your low-carb, high-fat diet. Lettuce, spinach, kale, cilantro, thyme, and more are incredible options that are low in carbs and full of nutrients. Vitamins, minerals, and phytonutrients are always found in green vegetables. Leafy vegetables are always the best options when it comes to your low-carb diet because they have the least amount of carbs in the vegetable family. They are full of fiber and vitamin K as well. They also have little to no impact on blood sugar, which is great for someone who might suffer from blood sugar issues. When going for nuts or seeds to snack on during your low-carb diet, you will want to remember a few things. While they are good for you, some nuts and seeds are legumes, which is a total opposite to the facets of a low carb diet. Peanuts are one culprit. Nuts are also high in Omega-6 fatty acids. Macadamias, almonds, cashews, walnuts, and pistachios are great nut options that are lower in carbs, though cashews and pistachios are higher than the others. You can even get nut flours that are great substitutes for regular flour which is never used in a low-carb diet. When preparing to start your low-carb, high-fat diet, you need to understand which sort of drinks are great for your diet plan. However, there are several things you can do wrong when it comes to your drinks. For your keto diet, one of the best things you can drink is water, of course. Water is hydrating enough to keep you from getting dehydrated, which happens a lot on a low-carb diet. Coffee is also acceptable, especially when you need an energy boost, but sugary creamers and extra sugar is never good. Tea is great as well, both herbal and unsweetened, but just like with coffee, you don’t want added sugar in your drinks. Ketogenic, low-carb diets have been around for quite some time, but the diet is beginning to come back into the spotlight with more science backing than ever before. When someone is preparing to start a low-carb diet, there is much to consider, especially about their food choices and drink options. Low-carb, high-fat foods are not as difficult to find as you might think. These foods can be found right in your local grocery store, and they are just as delicious as normal foods with added health benefits. Knowing what each food is good for and how it can help your diet plan is the key to a successful high-fat, low-carb diet. No matter what you choose to eat your diet, you should always remember to drink plenty of water to stay hydrated. Low-carb diets can cause you to lose weight but also energy, so eating many of the foods mentioned above is a great way to get more energy without blowing your diet. Going low-carb doesn’t have to be difficult. You can get your favorite foods, many delicious tastes, and health benefits all in one, and you don’t have to spend a lot of money to do it. Low-carb diets are great for many people, and you can do it too with just a little help.